I like books with pictures in them. This may surprise those of you who know that I have a Bachelor’s degree in Comparative Literature. (You know- because that means I read things.) I need to train myself to say “I like photography books,” because that statement will get me mistaken for a much more artistic and interesting individual. Sacha Goldberger‘s photography book, Mamika, is sure to entertain everyone. 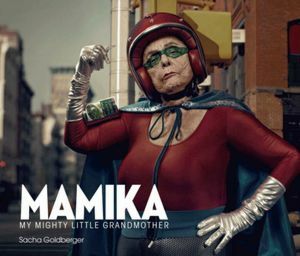 Can you imagine a ninety-something year old grandma dressed up in superhero costumes, riding a motorcycle, and even ironing a small dog? Luckily, you don’t have to imagine these things: Goldberger already beat you to it. Flip through these pages and you’ll find surprisingly wise (though often ridiculous) quotes from Mamika, Goldberger’s 93-year-old grandmother (a Jewish Hungarian immigrant to France) who “survived Nazism and Communism”) along with pictures of the delightful woman in fun getups and unlikely scenarios. The actual woman is a wonder, but her model/muse alterego is a real treat. Pick yours up at Barnes & Noble! ← Lemon Bars You Say? This book looks so ridicilous, I just have to pick it up and look through it the next time I’m at the book store. Thanks.